The Ford School Alumni Board is pleased to announce that Patrick Anderson (MPP ‘83) is the recipient of the 2014 Neil Staebler Distinguished Service Award. "Patrick has a long record of connecting sound analysis to the policy-making process, which is just what the Ford School strives to support,” says Alumni Board member Adam Cowing (MPP ‘08), who served on the Staebler Award selection committee. “His career also reflects the growing interplay among government, nonprofits, and the private sector in engaging timely public issues." 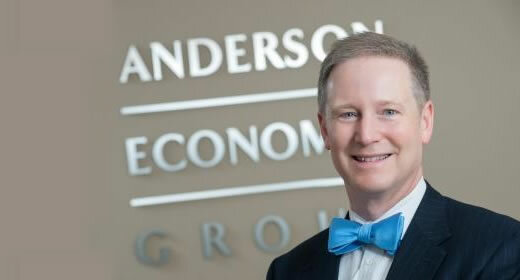 Anderson founded Anderson Economic Group (AEG) in 1996, and serves as the Principal and Chief Executive Officer in the company. AEG, a highly regarded consulting firm, has provided consulting services for a number of states, manufacturing companies, retailers, telecommunications companies, many other business enterprises, and to colleges and universities. The quality and scope of Anderson’s professional work has created a tremendous pipeline of jobs and internships for Ford School students and graduates. In addition, Anderson has generously shared his expertise and advice in a number of educational and career-building forums at the school. The Neil Staebler Distinguished Service Award is a program of the Neil Staebler Fund for Political Education, which was established at the Ford School in 1987 to honor Neil Staebler. Staebler was one of Michigan's leading political activists, and his public life was devoted to improving democratic government by increasing the participation of citizens in all aspects of public affairs. "During his lifetime career of public service, dad always sought to encourage fact-based decision making and active and informed public interest from the widest possible spectrum of viewpoints,” says Mike Staebler of his father, Neil. “His slogan was: the price of democracy is at least one hour a week from everyone." Before founding Anderson Economic Group, Mr. Anderson was the deputy budget director for the State of Michigan under Governor John Engler, and Chief of Staff for the Michigan Department of State. The Michigan Chamber of Commerce awarded Mr. Anderson its 2006 Leadership Michigan Distinguished Alumni award for his civic and professional accomplishments. Anderson has written over 100 published works, including the recently released Economics of Business Valuation from Stanford University Press. Anderson's views on the economy are often cited by national news media including The Wall Street Journal, New York Times, National Public Radio, and Fox Business News. Anderson earned his B.A. in political science from the University of Michigan in 1981 and his Masters of Public Policy in 1983. Anderson will be formally recognized with the Staebler Distinguished Service Award at the Ford School's Centennial Reunion on October 31, 2014.